The great fishing continues on both lakes Eucumbene & Jindabyne with good numbers and sizes of fish being caught regardless of method. Some rain has fallen in the hills and there have been fish in the Thredbo and Eucumbene rivers. Best fish heard of so far was a 5.2kg brown from the Eucumbene river mouth on fly. We do still need more rain to get a real run of fish happening so cross the fingers, pray and rub your favourite talisman and lets hope it happens before the rivers close. Rivers:- We have seen a few more fish move into the rivers - BUT we NEED some serious rain to really get the browns to run. Remembering the rules have also change (1st of May) on these rivers to 1 fish a day OVER 50cm.Due to the amount of anglers enjoying the fishing this season your best results will be found away from the main access area's.Other area's worth a look include the Mowambah,Gungarlin,Guthega pondage and Island Bend,Murrumbidgee and 3 mile dam. Best fishing is still with an attractor style dry fly with trailing nymph dropper.Patterns worth having in the box include Royal wulffs,stimulators,klinkhammers,elk hair caddis,red tags,hares ear nymph, pheasant tail nymph,some bead heads & Glo bugs won't be too far away either. *David and Blair from Sydney fished around the Providence end of the lake for 3 browns to 62cm and a 45cm rainbow. A black Wooly Bugger was the fly of choice. They also reported sighting some massive browns in the river. Lake Jindabyne:- Had some good reports back in from Jindy over the weekend. Mostly evening fishing with mudeye patterns and streamers like, Craigs Nightime, Woolly Buggers and Fuzzy Wuzzys etc. There has been some good day time fishing as well with buggers and horrors. Area's worth a look include Stinky Bay, Sid's bay, Hatchery Bay, Creel Bay , Snowy arm and Kalkite. *Peter Bright from Canberra and David Powell from Sydney fished Friday night for 19 rainbows to 1.5kg and dropped several fish. *David Jones from Sydney reported catching 15 nice fish during the day with only two being rainbows the rest browns. *Several other anglers fished the Saturday night and caught similar numbers, but location was all important. Some bays appear to be holding more fish that others and it pays to move around till you find them. One angler using two flies even reported a 'double header' and managed to land both rainbows of around a kilo!!! Great effort Matto. Eucumbene:- The great trolling continues, just stick to the main launching area's with the falling lake levels ie: Buckenderra - who have just put in a new gravel ramp with road base ! Old Adaminaby, Anglers Reach,Breamar Bay and the Dam wall for smaller boats. Both leadlines at 3 colours and flatlines have been producing the goods. The rainbows are in peak condition and averaging around the 1kg mark, feeding heavily on yabby's with the falling water levels, while some better browns have also started to show up as they get itchy for spawning. Consistent lures include Tasmanian Devils in Cols 36,89,55, 72,S12, Y82 & Y62. Our own Alpine Cobra's in the Alpine Attractor, Alpine Special,Pink Wings and Pink Bits patterns, Rebel minnows and crawfish,ultra deep Merlins,Stump Jumpers,Rapala minnows, RMG Scorpions & Poltergeist. *Nathan Mitchell with a nice brown caught on Tassie Devil #19 on four colours of leadcore. 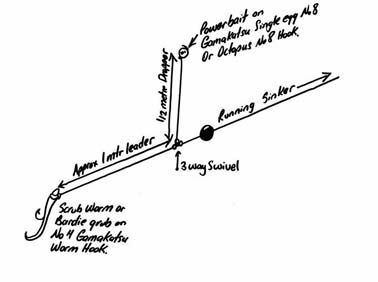 *Con Jackson caught 22 fish on fenders trailed with either Crickhoppers or scrub worms. Both flatline and leadcore produced fish. Anglers Reach was the best area for him. *Eight anglers from the Wooly Buggers club caught a total of 40 fish in the Braemar, Eucumbene cove area. Gold S12 Tassies and Y82 were the winning lures. Best fish was around the 3kg mark. *Henry Vrielink with a 1.150kg Brown on 1kg line. Fish was caught trolling a #2 Vibrax spinner in rainbow trout finish. Henry also landed and released a small brook trout. Jindabyne:- Reports from Jindabyne were mixed this week some anglers did very well while others struggled. Most caught at least a few fish. The best area's were out around the islands in the main basin in front of town & Sid's Bay and East Jindy, up around Waste Point and at the top of the lake around Kalkite. Fishing a mixture of small minnows like RMG Scorpions, Merlins , Rapalas & Attacks along with Tassies in just about all the "Yellow Wing",as well as our own Alpine Cobra's in the Alpine Attractor & Pink Wings patterns producing the goods. Now is the time to try drifting the river mouth of the Thredbo with bibless rattlers and soft plastics. This technique proved deadly on the browns last season and with a little perserverance can produce some great captures for those willing to try something a little different. *13 year old James Mazengarb with two of the seven rainbows he and father Geoff caught at Seven Gates. Orange Powerbait and Bardis did the trick. *Joe, Colin, and Gavin from Canberra fished Yens Bay and Rainbow Pines catching 13 rainbows in two sessions. The fish averaged 800 grams and were taken on Lime Twist and Orange Powerbait and a couple on scrubbies. * John Pene with 5 of the 9 rainbows he and Gary Watmore caught at Seven Gates. Lemon twist Powerbait and Scrubbies on a two hook rig proved very effective, with several of the fish eating both baits before the anglers could get to the rod.